The weather in Chicago has been keeping residents on their toes. Over the last couple weeks we have experienced snow, rain, hail, thunderstorms, blinding fog and temperatures ranging from the mid-50s to well below zero. There are lakes of slush and water at every crosswalk, and small mountains of snow marking the property lines of the few residents who shovel. I have been wearing my unfashionable, yet well-loved Asolo hiking boots in order to make my commute from Logan Square to the Ukrainian Village sure-footed and waterproof. Here is a perfect pairing of recipes for these unpredictable winter nights. Let rest for 10 min. Remove from heat and blend with an immersion blender--strain if desired. How brilliant! 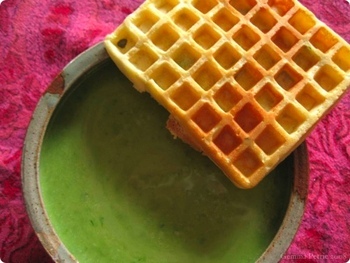 A waffle to pick up soup--it's perfect, with all those holes! Looks great. Always on the lookout for a new soup to make (I've been stuck in a 3 soup weekly rotation since fall). I've enjoyed stopping by here a couple times a year for a few years, but I think I may have to come by more. Especially if you post more savory waffles. This recipe has me wanting to purchase a maker, can't justify the cost when I don't eat breakfast waffles. Savory waffles--how wonderful! I love savory crepes, but savory waffles had never occurred to me. And Marion just looked over my shoulder and is totally ready to make the soup. Looks delicious. What waffle maker would you recommend? I've been wanting one for awhile, but every Amazon one has mediocre reviews. Thanks. Oh my goodness, those colours are absolutely stunning! Love the idea of a savoury waffle. Waffles? With soup? Oh my. How have I never done this before? It sounds de-freaking-licious! I'm trying it ASAP! Sour cream waffles sound great! I love soup with some bread next to it so this might be perfect! Terry B. said: "Looks delicious. What waffle maker would you recommend? I've been wanting one for awhile, but every Amazon one has mediocre reviews. Thanks." If this is your first waffle maker, I'd suggest getting something that's easy to clean up and not too expensive. I got my cousin the Cuisinart WAF-R Stainless for her birthday after looking around on this site that has different ways you can search for waffle makers based on what specific features you want it to have. My advice, stick with the big brands: Cuisinart, KitchenAid. Getting one for under $50 is not hard at all. Thanks everyone! Terry, I have a pretty crummy waffle maker, but it does the job well enough that I can't justify buying a new one. One day though..!